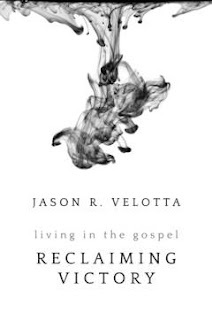 Jason Velotta has written a much-needed book to the Body of Christ. Reclaiming Victory-Living in the Gospel is a powerful book that reveals that victory and the abundant life has already been won for us through the Cross. This book not only sheds light that we are saved by grace alone and by the atonement of the Cross, but that Christians simply have left the Gospel on a search for fulfillment, peace and joy, when in fact, that joy is in Christ and in the truth of His word. By refocusing our attention and addressing false perceptions and beliefs, the author has written an amazing book that will help you realize that-"…victory has already been won!" The author states, "Only when we truly rest in the finished work of Christ, do we find victory. The victory has already been won." This is a revelation to most people. In fact, as the author states that as a Christian matures, it is expected that joy will diminish. That is not the Gospel, nor the good news of the Gospel. Diminishing joy is not what Christ endured the shame of the Cross for. He endured that shame for others, so that they might live through Him and through His Word-the Gospel. If you are tired of seeking, tired of trying harder or having your worth being based on your performance-this book is for you. This book will bring truth and light to your soul as you re-discover the truth of the Word of God. The author has written this book as a call to all those believers who have lost the joy of their salvation. This joy can be recaptured and reclaimed. Come and see what the author has to say. This book will open many eyes to false beliefs and doctrines that have been preached from the pulpit and direct readers back to the victory that is already theirs in Christ. A highly recommended read for the entire Body of Christ that is life giving and life-changing. For more information about Author Jason Velotta visit Reclaiming Victory-Living in the Gospel where you will be encouraged, uplifted and blessed. You may order the book Reclaiming Victory-Living in the Gospel from at the author's website or through Amazon. A Christian Book Marketing book review.